I grew up at the bottom of a big hill, across the street from Hardy’s Salt Factory (now gone) in Manistee, Michigan. Our family didn’t get a television set until the early 1950’s when I was about twelve years old. Because of this location and only a small antenna on our roof, the reception on the few channels we were able to pick up was very snowy. I remember watching only comedy and western shows. The main sport at the Catholic school I attended was basketball. The public school also had basketball along with football, baseball and golf. In high school, the only sport I was involved in was cheerleading. Other than knowing about the sports at our schools, I had never heard of the variety of other sports played by athletes from all over the world at a very special event that took place every four years, now every two years. In 1984, when I was married and living in Allegan, Mich., I heard about those special games for the first time when the flame was traveling to Los Angeles but circumstances prevented me from seeing it when it traveled near where we lived. The next time the flame was in the U.S. was in 1996. It was on its way to Atlanta. Again it would be passing nearby, but this time my husband and I got to see it and that’s when I got inspired to be a torchbearer. It was truly a dream come true when I had the opportunity to carry the flame on January 3, 2002 as it traveled through Fort Wayne, Indiana on its way to Salt Lake City. I tell about when I first filled out the application and then give a detailed story of the adventure of a “regular citizen” being chosen for this special honor. I also mention several panic situations. 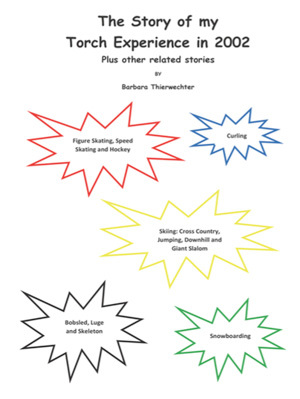 Stories of a ski slope volunteer and a participant are included. Hope you enjoy how I accomplished my dream. This book is meant to encourage others to realize their dream, to set a goal and achieve it. Then, like me, they will also have a great story to tell to encourage others.